(4) Capacity-Building: Collaborative Facilitations and Skills-Building Workshops. This Program is designed to fill the niche as a broader, more integrative approach that explicitly integrates human, policy, and scientific dimensions of water resources within the framework of governance and sustainability, and focuses training and research on all facets of water conflict transformation. The PWCMT serves as a training, resource, and information hub for students, citizens, officials, and business leaders in Oregon, across the United States, and internationally, facilitating dialogue on critical water issues across diverse values and perspectives. 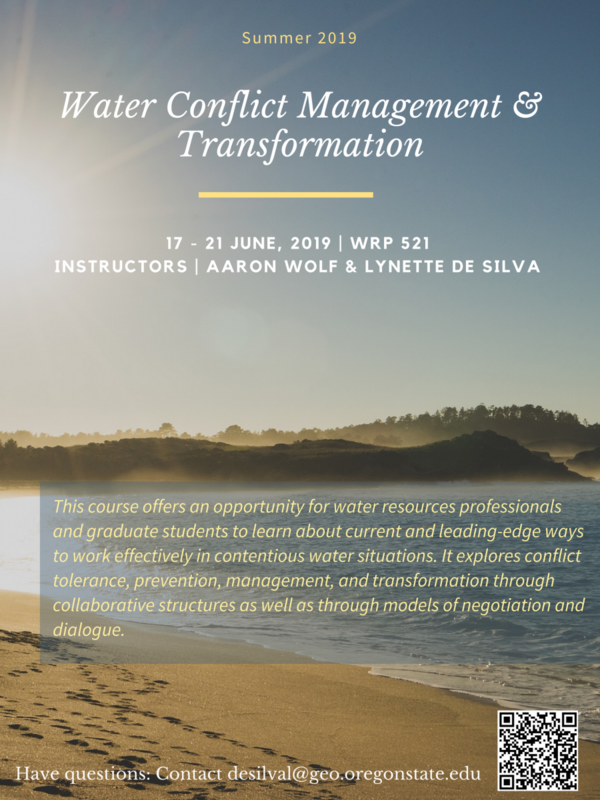 Learn more about the Program in Water Conflict Management and Transformation. Thank you for visiting the new website for the Program in Water Conflict Management and Transformation and the Transboundary Freshwater Dispute Database. As we finalize the development of the new site, we would appreciate any comments for improvement of the site as well as notification of any errors, such as missing links. Contact Us.